We created the Original instant barbecue that has been mimicked the world over, but what’s certain that we have a reputation of making the market leader and the best performing instant BBQ available. Over double the grill area of the Instant at 46 x 27cms, with twice the charcoal content. We pride ourselves in using ethically sourced and FSC charcoal in all our instant grills. All our instants will light easily and quickly with a single match no need for any assistance. We say our grills will ‘burn’ for over an hour giving a good cooking time. Our larger party grills are capable of cooking a meal for upto 8 adults. All you need for a great barbecue all you need to do is provide the food. 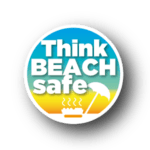 …is being launched during the 2018 season to educate us all on the safe ways of using the Bar-Be-Quick Instant Barbecue on a public beach. Click the logo for more info. A SIMPLE EFFECTIVE DESIGN THAT WORKS TIME AND TIME AGAIN. We have specially designed our sturdy folding wire stand to safely hold an instant BBQ. The NEW Bar-Be-Quick Barbecue Stand fits both Bar-Be-Quick Instant and Party Barbecues. This stand folds flat without need for any assembly, is light and portable – and will always hold your barbecue safely and securely whilst you cook! The barbecue grill at a safe height from the ground so you don’t scorch the grass or leave a nasty bun on a table. Just a single match is all you need, remember to place on a firm flat surface that’s not effected by heat as the base of the barbecue gets very hot..
and be a part of the big international BBQ family.